Elegance, Comfort, Sportiness. 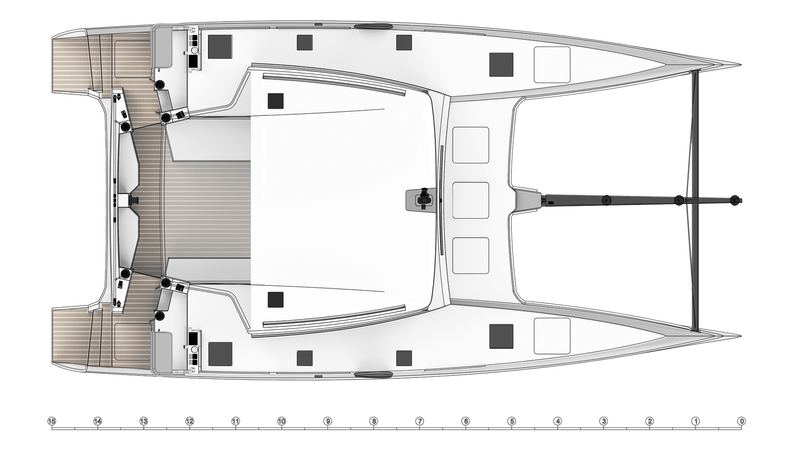 Three different souls for an innovative hull, conveyed by elegant and dynamic lines. A work of high naval engineering, born from the vision to combine Italian elegance and attention to detail with the best and most advanced international technology. 14.99 is the first project created by ITACATAMARANS: a multihull of excellence, technologically sophisticated, safe and comfortable, redefining the world of catamarans. ITA 14.99 a catamaran among the safest in the market. The elegance of the design and the attention to detail are distinctive of the “Made in Italy” style and craftsmanship in the world. 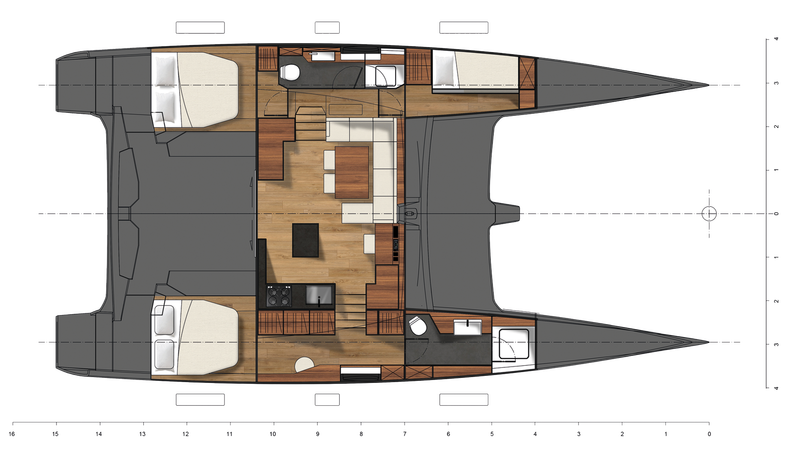 The design elements are expressed by the latest generation of water lines, reminiscent reinterpretations of the visionary catamarans of the America's Cup, without any sacrifice to vessel livability and comfort. 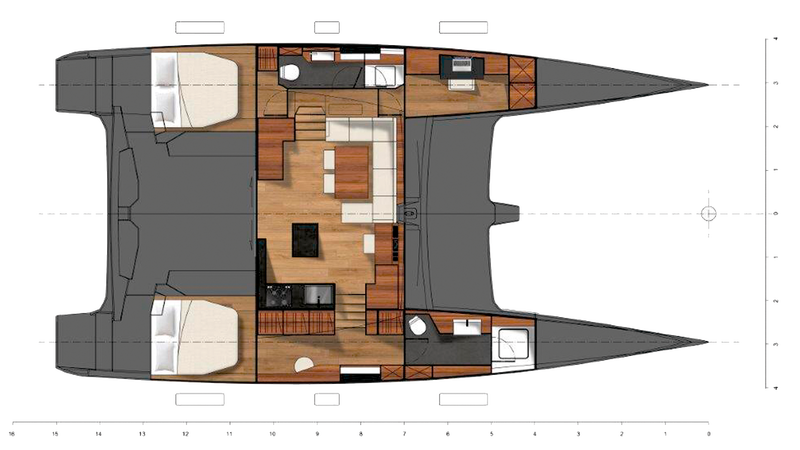 Dynamic hulls with flowing lines, housing spacious interiors. An attention to every detail so that you can enjoy the thrill of sportiness combined with the comfort of the best cruisers. ITA 14.99 is designed and thought out for easy sailing at the highest standards of safety, in every situation and condition, even single-handed. 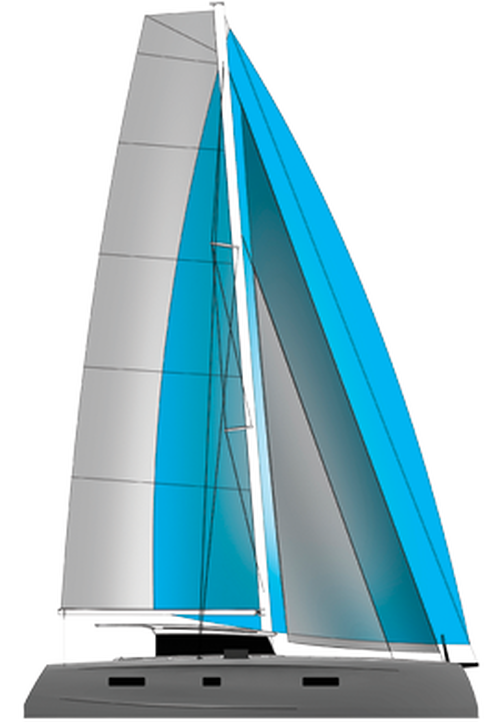 The Sail Plan is representative of ITA14.99’s design: modern, elegant and efficient. A fractional rig was setup for ease to single-handle or with a reduced crew. 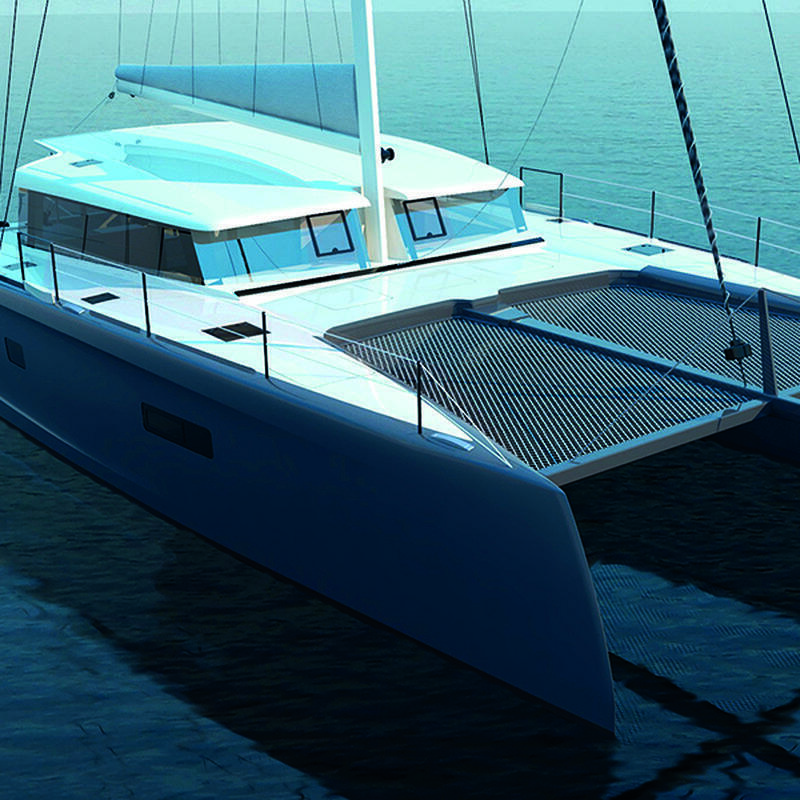 With the boat’s displacement, the self tacking jib and square top mainsail are enough to power the catamaran. Moreover, with ITA14.99 creating her own wind, the apparent wind is almost always upwind thus the self tacking jib the perfect foresail. The high aspect ratio of the sails make them more efficient for the same area. With light breeze we recommend to furl the jib and use a Code 0 which will power the boat faster than wind and get your pulse rising! 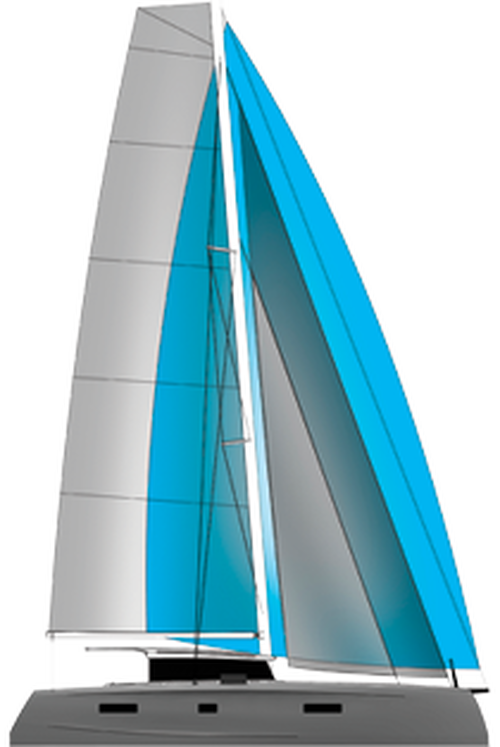 The design of the mast foresees two exits at the top to have an halyard also ready for downwind sail. 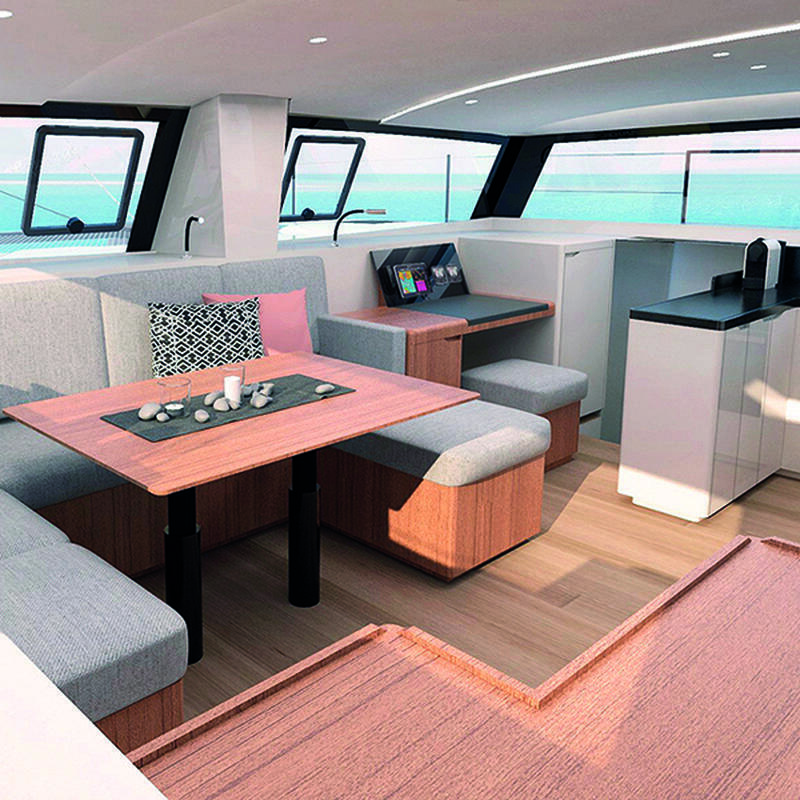 Sustainability, a philosophy vigorously pursued by ITACATAMARANS, which finds its ultimate expression in the innovative solutions adopted on ITA's 14.99 catamaran. 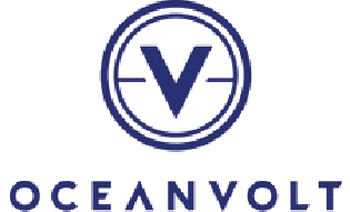 Thanks to the important partnership with OCEANVOLT, Finnish global leader in electric propulsion for pleasure boats, ITA 14.99 is sustainable, clean and self-sufficient energy-wise. 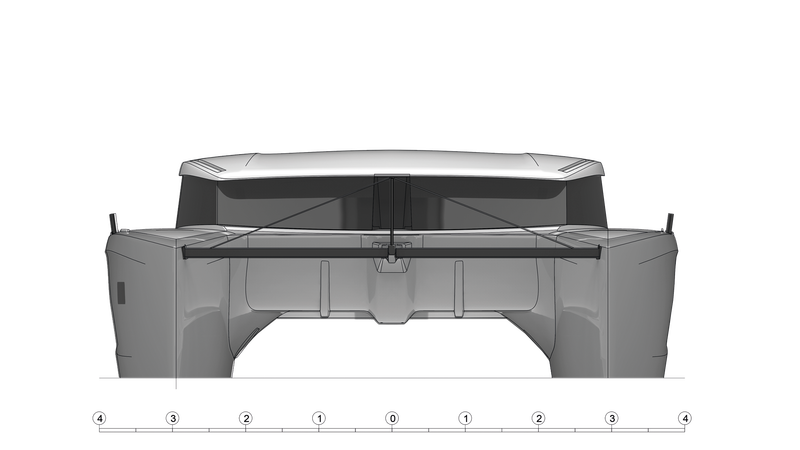 The lithium batteries are recharged during sailing through the same propellers and a system of solar panels can work in parallel to generate the required energy. 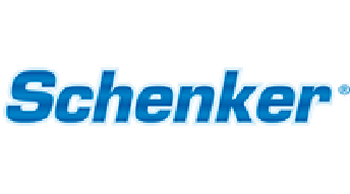 Furthermore, ITA 14.99 is equipped with a SCHENKER disalter which uses "Energy Recovery System", a new patented device that amplifies the normal pressure of low-pressure pumps and recovers all the return hydraulic energy from the membranes, allowing for a reduction of power consumption up to 80%. ITACATAMARANS' goal is to offer a high quality product with superior innovative content and excellent service every day of the year, without compromising in any way aspects of sustainability and safety. The legal and administrative headquarters of ITACATAMARANS Srl are in Veneto while the region of Marche was chosen as the production site. The Region of Marche, the Silicon Valley of boating offers a unique scenery of artisans and small, highly qualified companies that have taken root there, with manufacturing capabilities unmatched by other districts. It is from this center of excellence of craftsmanship that ITACATAMARANS draws on for the expertise in the realization of its product. ITA presents itself to the market with a streamlined but highly specialized team, bringing together highly qualified people who over the past 25 years they have gained significant expertise and a wealth of experience in specific sectors both in Italy and abroad. 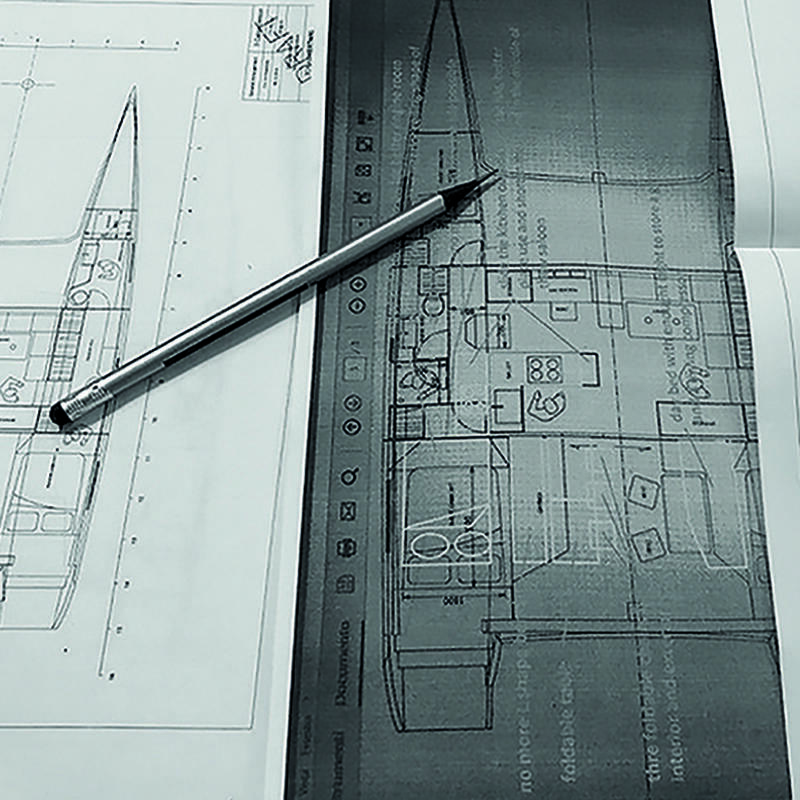 Several experts collaborate with the ITA team of specialists and experts in composite infusion, architects and designers to the various skilled workers boating and more. 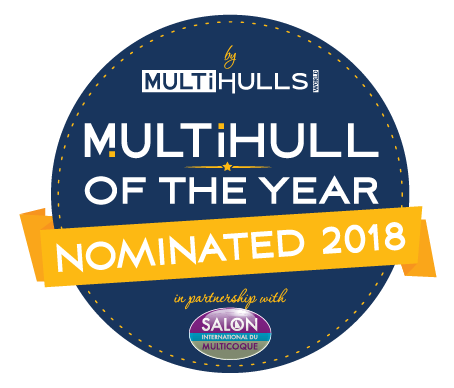 But above all, people who have a passion for sailing and the desire to offer customers a product of the highest standards that can be offered in term of construction, design, performance and comfort. Itaca sailing in the Ligurian Sea. A quick look at Itaca, our first ITA14.99. According to Art. 25, paragraph 12 of Decree n. 179/12, converted through L. 221/12 - DL 76/13, converted through L. 99/13, it is confirmed that the company is registered in the special section of the innovative Startups and SMEs, held at the competent CCIAA, given that: IT POSSESSES THE INNOVATIVE START-UP REQUIREMENTS, due to the RIGHT OF USE OF OCEANVOLT's SD15, SD10, S08 AND 506 SYSTEMS WHICH USE THE PATENTED SYSTEM FLEXMOUNT (PATENT - LICENCE APPLICATION NUMBER 20130260622).